Totoro is the symbol of Studio Ghibli. The smiley, grey beast began life as part of a double-bill with Grave of the Fireflies because financiers didn’t believe My Neighbour Totoro alone would make money. By screening the cute and cuddly My Neighbour Totoro with the harrowing, deeply moving Grave of the Fireflies, the assumption was it was bound to succeed (despite the jarring tone of each tale). Following the release, the films were initially only mildly successful – critically acclaimed maybe, but not enough to financially secure the studio. What ensured the longevity and creative freedom of the studio was exceptionally successful merchandising from the characters created in My Neighbour Totoro (and, over time, the steadily-growing audience of each film). The story itself is relatively simple. A father and his two daughters move to rural Japan, to be closer to their mother, who remains in hospital (possibly based on Miyazaki’s own experiences as his own mother was in hospital during his childhood). In the new house, the two children Satsuki and Mei find dust-creatures named susuwatari. This begins a fascination with forest creatures and the spirituality of nature. One afternoon, as Satsuki is at school, Mei explores the forest and chases after a small, vanishing creature. 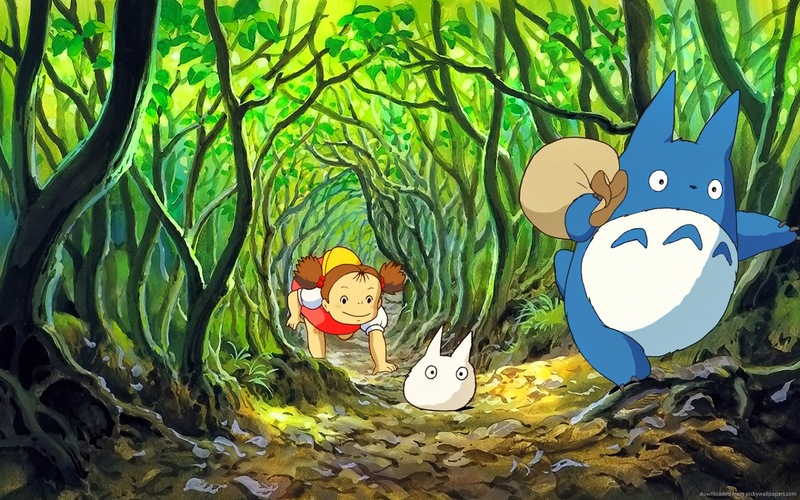 Akin to Alice chasing the White Rabbit, Mei chases the creature through the forest and, falling down the rabbit hole, finds the magical and majestic forest spirit Totoro. He sleeps and snores. He doesn’t speak her language, but there is a connection. Satsuki convinces her sister and, with father in tow, tries to find Totoro. Their father explains how Totoro revealing himself to them shows a mutual respect and is a great honour. In an unforgettable sequence, we see a nekobasu– a cat-bus – collect Totoro after Mei’s first encounter with him at a rainy bus-stop. We witness the girls as they see Totoro play his Ocarina on a branch and prove his ties to the environment, forging a tender relationship. Nature, spirituality and the wonder of childhood are prominent features in the Studio Ghibli canon. Whether it is the way humans interact with nature in Princess Mononoke or the destruction of nature by man in Grave of the Fireflies; a ghost spirit of No-face in Spirited Away or the child at the centre of Ponyo; My Neighbour Totoro includes these thematic elements throughout. The final act of My Neighbour Totoroeven includes a wonderful flying-sequence as the nekobasu flies the two girls to see their mother, as the wind rushes through the fur of the cat, we join them in the sky. 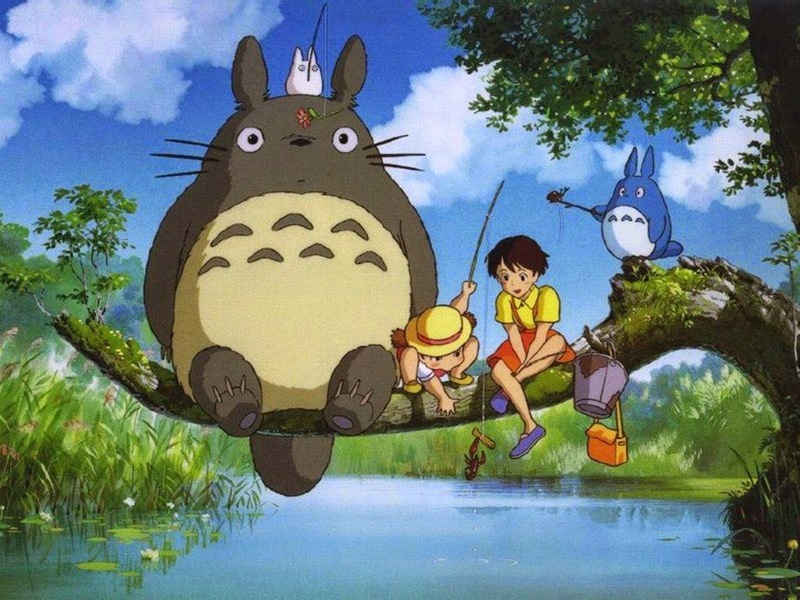 As we fly in so many of his films, this is a joyful reminder of the incredible imagination of Miyazaki and how he captures the lush, green fields and blue skies in animation. This was 1988, four years after the world wide success of E.T. and six years after The Snowman. In both cases, a mythical creature enriches the life of children, carrying them over the wonders of nature. This may be a surrealist fantasy, but it’s about friendship and the connection we have with these spiritual forces (and what spirituality teaches us too). Considering the backstory of the Mother’s sickness in My Neighbour Totoro (And, in the double-bill, the history in Grave of the Fireflies), there is a sense that nature and the innocence of childhood, in the face of adversity, should be treasured above all. The fun and friendship of Totoro and his companions keeps these particular children happy. Their mother and father are going through a horrific period (is it life-threatening? Will these poor girls lose their mother?). Is this when children should be taught of the fragility of life? When Satsuki finds out about her mother, she puts her own life in danger as she walks the long and lonesome road to the hospital. Perhaps, the innocent child has to slowly and gently learn about the world. A distinctive charm is what maintains My Neighbour Totoro’s ever-lasting power. Such sincerity and a terrific sense of wonder means that we can, for a moment, be a child again ourselves. Through the looking glass of cinema, we can see Totoro and the creatures too – and what a memorable sight it is. I love the animation in this film!